Google wants Google+ to be the focal point of your interaction on the Web. Whether you’re visiting websites and +1’ing them or you’re an author look to build your authority, Google really wants Google+ to be the place you do it. 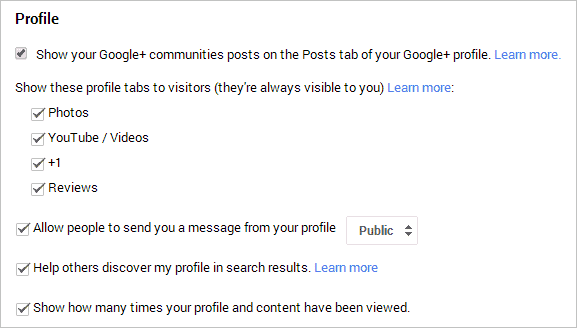 Google has rolled out changes to user profiles to include view counts when you or someone else visits. While they haven’t exactly explained why this is pertinent, there is a way to turn them off if you don’t want visitors to see. We’ll show you how to turn off your Google+ view count and why this is both good and bad for you if you’re using the social network to build your reputation online. In order to hide your Google+ view count, you need to be logged into Google+. Click on “Home” in the left-hand corner of the box. Scroll down to “Settings” and click on it. Now, scroll down further until you see Profile. Google+ will automatically save the change and it takes effect immediately. Visitors, and you, will no longer be able to see your Google+ view count. If you ever want to show it again, you follow the same steps above and check the box next to “Show how many times your profile and content have been viewed.” As of now, some users have reported this takes effect immediately, others have said it takes a few minutes to go live. Why Hide Your Google+ View Count? Some users may not feel comfortable with their view count. If you’ve just started using Google+ or are trying to gain influence and don’t think users will take you seriously, hiding your view count may be a good idea. It may even just make you feel better about using Google+. However, if you are trying to gain authority and recognition online, showing that you’re someone who wants to be seen and has no issues with it can be rewarding. Wouldn’t you want to follow someone who has over 10 million view counts as opposed to less than 5,000 if they’re an authority in their field? This not only shows you they’re getting visibility but that people are actively searching them out, checking out their Google+ profile and Circling them.